Don't ban yourselves, Guys! rebel against the mods! Steve won't complain. Art / Re: Doodle Your Post! I hate that Plank's gone. I HATE Plank being banned. Sometimes. That is what I will do now. Expect an update soon. @badger: Leomitosas is already faster then the Duo-Yellow Cell. There's no need. Plus, I believe that if this organism is gonna be more advanced, it will have to go multicellular. @TimeMaster: Same thing goes to Reproduction. I dunno. Ask somebody on TWC. can the newer ones be added? Perhaps N:TW is everything but in name, an expansion to ETW. ...I couldn't feel my spine after that. I hate being grif. 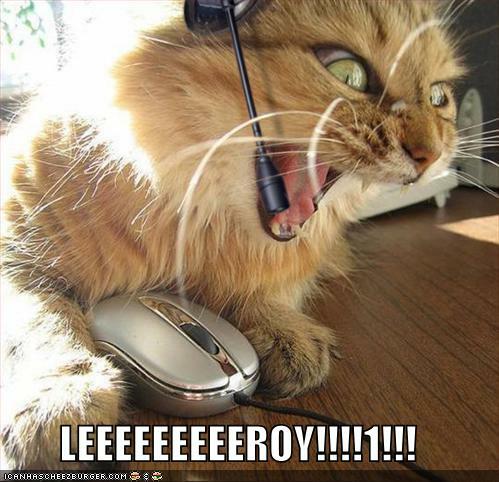 Forum Games / Re: Story of the Lolcats! Alright kitkat, I'm going in! Spore: Roleplaying and Story Games / Re: "The Library of Spore stories, OOCs, etc!!"